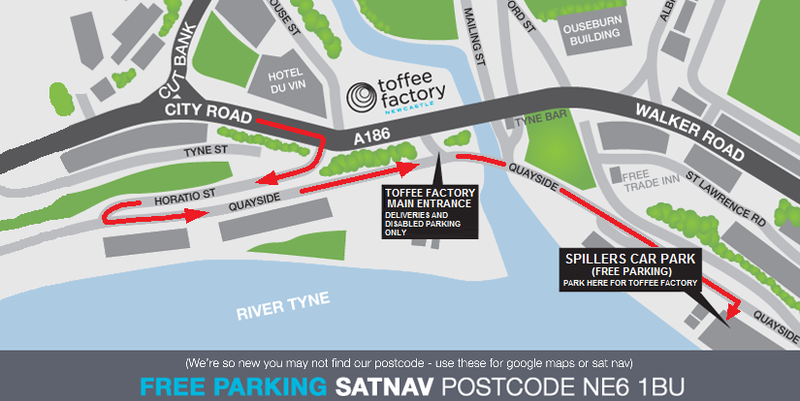 The entrance to Toffee Factory is on Quayside, not on City Road. If you are stood on top of a bridge looking at the building, you are on the wrong level! Go down the hill next to Tyne Bar and enter the building there. A free 100+ space car park “Spillers Car Park” is just two minutes away from Toffee Factory. The SatNav postcode is NE6 1BU. You’ll also see brown signs to this car park. The car park is on Quayside, Spillers Quay, adjacent to The Cycle Hub. If you are driving along City Road from Newcastle centre, turn sharp right as you reach Hotel du Vin. Go down Horatio Street and turn hard left at the bottom on to Quayside. You’ll pass Toffee Factory on your left in 100 yards. The car park is on your right, 50 yards past Toffee Factory. The QuayLink Q3 bus runs past Toffee Factory (timetables here). The closest bus stop to the building is on the Glass House Bridge. You will find yourself on our second floor, press the intercom and come down the stairs to reception. The 12 and 18 bus stops closest to the north and west of Toffee Factory are located on Walker Road, to the north of the site and the Quayside, Mariners Wharf to the west of the site and are approximately 120 yards and 350 yards respectively from the building. The closest Metro stations to the development are Byker and Manors. Byker Station is approximately 1.2km to the north of the site on Conyers Road. Manors Station is located approximately 1.9km to the west of the site on Newcastle Business Park. To see how to get from Newcastle Central Station to the Toffee Factory please watch the video below.